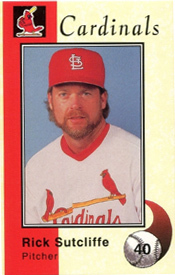 On Jan. 31, 1994, the Cardinals signed Rick Sutcliffe to a minor-league contract and invited him to spring training with the hope he could earn a spot on their roster and in their starting rotation. It was a sure sign of the desperate state of the Cardinals’ starting pitching. Sutcliffe had injured a knee in 1993 and posted a 5.66 ERA in 28 starts for the Orioles, but the Cardinals saw him as an inexpensive solution to replace starting pitcher Donovan Osborne, who was sidelined for the 1994 season after having shoulder surgery. “I have no doubt I can still pitch,” Sutcliffe told the St. Louis Post-Dispatch. Common sense indicated the Cardinals, owned by an increasingly disinterested Anheuser-Busch, were more focused on expense savings than in winning championships. “That move showed me they’re not going after somebody who’s in the top of his prime,” said candid Cardinals pitcher Bob Tewksbury. Though he posted a 6.60 ERA in spring training games, the Cardinals opened the 1994 season with Sutcliffe, 37, in their rotation. “I don’t know if I’ve ever had a pleasant experience in this ballpark,” Sutcliffe said. In 11 career appearances at Atlanta-Fulton County Stadium, Sutcliffe was 0-5 with a 6.70 ERA. Sutcliffe had a couple of other disastrous starts _ seven runs in two innings versus the Marlins on June 15 Boxscore and eight runs against the Rockies in 5.1 innings on July 17 Boxscore. Sutcliffe earned wins in three of his last four decisions. In 16 appearances (14 starts) during the strike-shortened 1994 season, Sutcliffe gave up 93 hits in 67.2 innings, posting a 6-4 record despite a 6.52 ERA. In his 14 starts, his ERA was 6.78. Sutcliffe, in the last season of an 18-year major-league career, symbolized the sorry state of the 1994 St. Louis staff. The only two standouts were relievers Rob Murphy (3.79 ERA) and John Habyan (3.23). The primary starters were Tewksbury (5.32 ERA), Vicente Palacios (4.44), Allen Watson (5.52), Sutcliffe (6.52), Omar Olivares (5.74) and Tom Urbani (5.15). Overall, the 1994 Cardinals’ staff ERA was 5.15, tied with the Rockies for worst in the National League.